Syamaprasad Institute of Technology & Management, also known as SITM is a reputed institute located in West Bengal and is engaged in imparting quality education in the field of technology and management. The private college was set up in 2002 by a non-profit registered society called SIAE. It offers education programs in the field of management, commerce and science. The vision of the institute is to churn out promising professionals to cater to the future needs of global industry. It focuses on all round development of the students, covering not only their knowledge and skills, but also looking after their moral, social and personality development so that they can meet the toughest challenges in the professional environment. The institute boasts of highly qualified and trained team of faculty members, who have a great deal of experience behind them. They ensure that students not only polish their theoretical skills, but also gain all kinds of practical knowledge to help them face real life situations in a confident and mature manner. Additionally, the institute offers best in class amenities along with modern and well developed infrastructure, which gives it an excellent environment for learning and gaining knowledge. The course fee structure is highly affordable, bringing quality education in the budget of many more. The institute offers a wide range in courses under the affiliation of West Bengal University of Technology. The college is accredited by AICTE. Qus: How do I get an admission in Syamaprasad Institute of Technology and Management? Ans: If you are looking for direct admission Syamaprasad Institute of Technology and Management, Bright Educational Service is the right place for you which have India's top most direct admission consultants and where we give 100% assurance of admissions in India as well as admissions abroad. Qus: Which are the entrance exams accepted by Syamaprasad Institute of Technology and Management? Ans: Syamaprasad Institute of Technology and Management will accept the entrance exam scores of JEE Main, WBJEEB for admission. Qus: How is the atmosphere there in Syamaprasad Institute of Technology and Management campus? Ans: The Syamaprasad Institute of Technology and Management college atmosphere is good. Which is offering the great infrastructure to the students for healthy physical and mental growth. Qus: Does the Syamaprasad Institute of Technology and Management college have hostel facility? Ans: Yes, Syamaprasad Institute of Technology and Management has separate hostel facility for both boys and girls. It is situated in inside a campus. Qus: What are the infrastructural facilities provided by Syamaprasad Institute of Technology and Management? Qus: How is Syamaprasad Institute of Technology and Management? Is it a good college? Ans: As per collage standards, no doubt there are better colleges than Syamaprasad Institute of Technology and Management, which say provide better campus recruitment, better quality education and better college campus, better environment, etc. 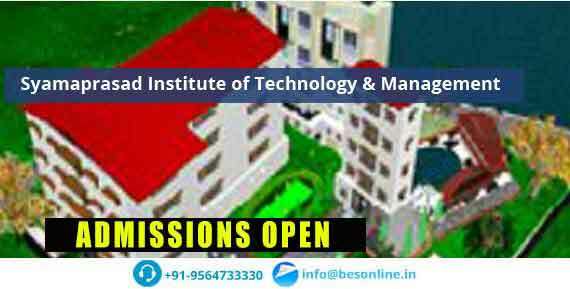 Direct Admission in Syamaprasad Institute of Technology & Management , Direct Admission Procedure in Syamaprasad Institute of Technology & Management , Syamaprasad Institute of Technology & Management Direct Admission 2019, Syamaprasad Institute of Technology & Management Direct Admission Procedure 2019, How to get admission in Syamaprasad Institute of Technology & Management , How to get direct admission in Syamaprasad Institute of Technology & Management , How to get management quota admission in Syamaprasad Institute of Technology & Management , How to get NRI quota admission in Syamaprasad Institute of Technology & Management , B.B.A/B.C.A direct admission in Syamaprasad Institute of Technology & Management , B.B.A/B.C.A direct admission procedure in Syamaprasad Institute of Technology & Management , Syamaprasad Institute of Technology & Management B.E/B.Tech Admissions 2019, Syamaprasad Institute of Technology & Management B.E/B.Tech Admissions Procedure, How to get B.B.A/B.C.A direct admission in Syamaprasad Institute of Technology & Management , B.Msc/Bachelor degree direct admission in Syamaprasad Institute of Technology & Management , B.Msc/Bachelor degree direct admission procedure in Syamaprasad Institute of Technology & Management , Syamaprasad Institute of Technology & Management M.E/M.Tech Admissions 2019, Syamaprasad Institute of Technology & Management M.E/M.Tech Admissions Procedure, How to get M.E/M.Tech direct admission in Syamaprasad Institute of Technology & Management Top Bca Colleges In West Bengal. Top Bca Colleges In India.